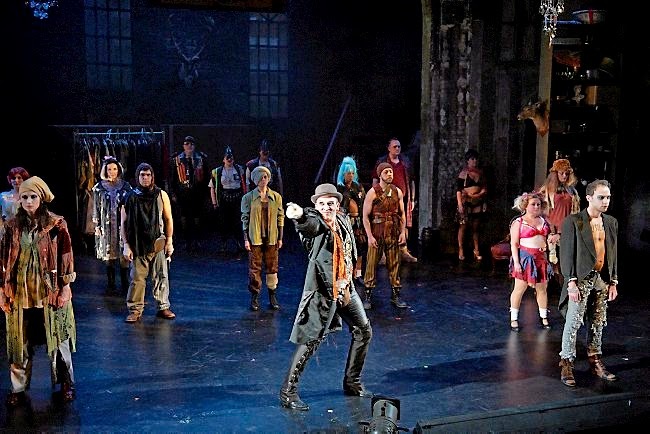 First produced in 1928 in Berlin, The Threepenny Opera tells the story of a criminal/mobster/thief named Macheath (aka Mack the Knife) in Victorian London. When Mack marries the daughter of his rival Mr. Peachum, head of the beggars, Mr. Peachum retaliates by trying to get Macheath arrested and hung. Despite Mack's many crimes, it's not an easy task since the police chief is Mack's buddy. But eventually, Mack is jailed and about to be hung when he's suddenly miraculously freed. The story is told through a series of vignettes and songs, with each character getting their moment to be heard. While the Off-Broadway is perhaps a more classical interpretation, with Macheath in a pinstriped suit, bowler hat, and spats, Frank's production, with Macheath in a leather jacket, make-up, and tall boots, is more modern, grungy, and well, weird (in a good way, although I have to say I miss the spats!). It veers a little further into camp, which really works because it is kind of an odd piece. First and foremost: Bradley Greenwald** as Macheath. He's dark and twisted and his gorgeous voice fills every corner of the spacious Southern Theater with no need for amplification. Speaking of - I love it when actors in musicals are not miked, and there's nothing to come between their voices and my ears. It's rare, and perhaps difficult to do when mixing sound with a band (or at least that's the excuse I've heard), but with a small band like this (musical director Sonja Thompson on piano and organ, with actors occasionally joining in on various instruments) and the excellent voices in this cast, it's quite possible and creates a perfectly mixed and unaltered sound. As Mr. Peachum, Gary Briggle is deliciously mischievous and mustachioed, and well-matched by Janis Hardy as the wig-adjusting Mrs. Peachum. Mack's women are all fantastic, from Suzie Juul's absurdly silly Polly Peachum, to Molly Sue McDonald's world-weary Jenny, to Kira Lace Hawkin's slightly crazy Lucy. Particularly excellent is the duet between Polly and Lucy as they're fighting over Mack, hilariously and beautifully sung by both Suzie and Kira. I was delighted to see the reunion of Officer Lockstock (Bradley Greenwald) and Little Sally (Elisa Pluhar) from last summer's Urinetown, although in a very different set of circumstances with a very different relationship! This is a huge cast and they all do great work. 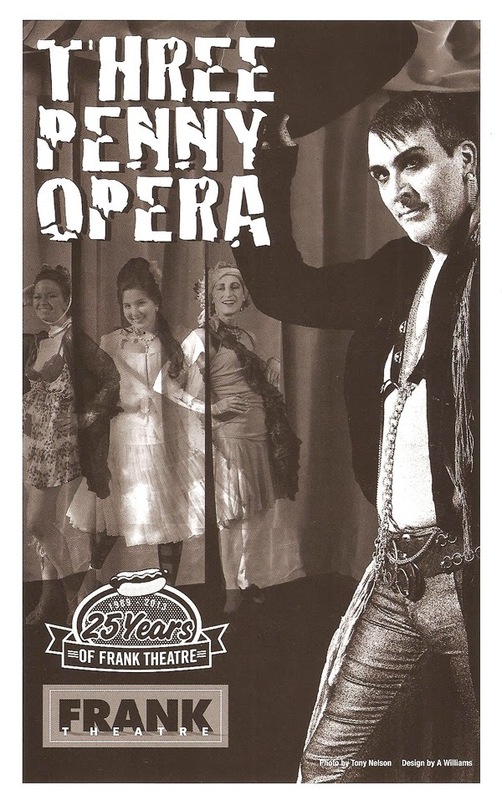 The Southern Theater is all decked out with racks of clothing and huge shelves full of tchochkes (set by Joe Stanley), and the costumes (by Kathy Kohl) really help to define the weird and wacky world of this Threepenny Opera. I've enjoyed my foray into The Threepenny Opera this month, and I have to say I have a greater appreciation of the play and especially the music after a second viewing. Frank's production is well-cast, weird, and entertaining. And with sold out houses that include many theater people, they're obviously doing something right. But be forewarned: with an 8 o'clock showtime and a three hour running time, this is another one that requires a good night's sleep before attending. *Read my thoughts on the Atlantic Theater Company's production here, and yes I did plagiarize myself for some of the background info. **Bradley Greenwald will again be singing the music of Kurt Weill (along with two of my other faves, Dieter Bierbrauer and Christina Baldwin) in Skylark Opera's Berlin to Broadway in June, which I hear is also directed by Wendy Knox.